I'm so happy with the way this mani turned out. The combination of the different toned golds together with the combination of matte and chrome like shine just matched my jewellery so perfectly. I felt like a million bucks wearing this. I used Priti NYC Chrysanthos as my base colour, which I then mattified using Essie Matte About You. I then applied some foil glue to just the tips of my fingers and allowed that to dry completely. 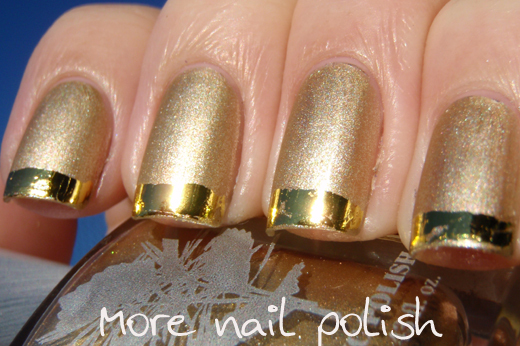 I then used some gold nail art foil on the tips. These photos were taken before I applied top coat to the tips, because I knew the top coat would slightly wrinkle the foil, which it did, but it also meant that the tips would stay on longer that an hour! I am so totally off to do a silver version of this right now, in fact given the number of different coloured foils I have, I'm going to have to check out what other colour combinations I can pull together. Wowsas!!! !Your nails look like a million bucks!!! Whoaaaaaaaaaaa!!! Your nails looks HOT!! That is so classy - totally WOW!!! i love this too. the polish is such a good gold color. Ooooh this looks awesome! I'm keen on doing an ebay haul for some nail art foil to have a play around with! Wow that looks so beautiful and classy! 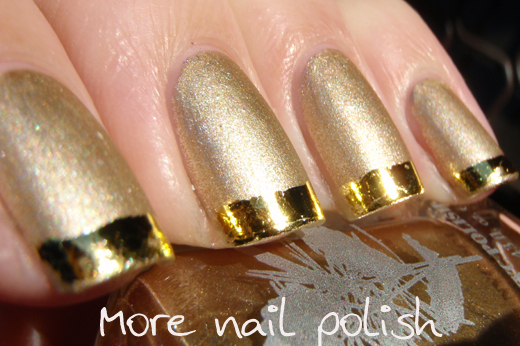 I don't normally like gold polishes but you might've changed my mind with this mani! 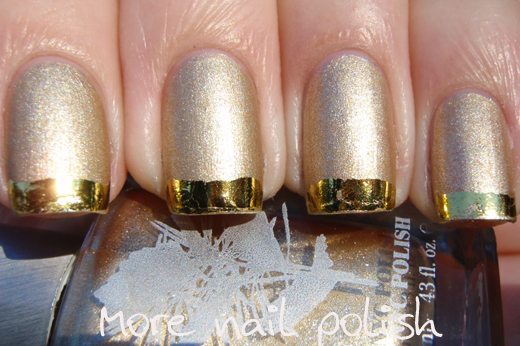 Yes this does look most fabulous and makes me finally want to order some foils! this is cool!! i bet the tip wear is immediate! i wouldnt touch a thing if i was rockin' these - nice work! Loooove mixing metals...especially after I did my first mixed metals mani! This looks fab! I never have heard of foil glue - where do you get it? - how easy is it to get off? - will regular acetone take it off? This is the finish I have been looking for - that ultra shinny like the gold foil glue is.